Wayne State police officer Brandon Murphy and his partner, Andre, have become accustomed to students and staff flagging them down for a selfie. It has become a daily event as they patrol the Midtown area. After all, it’s not every day you see a police officer and his horse walking down a city street. 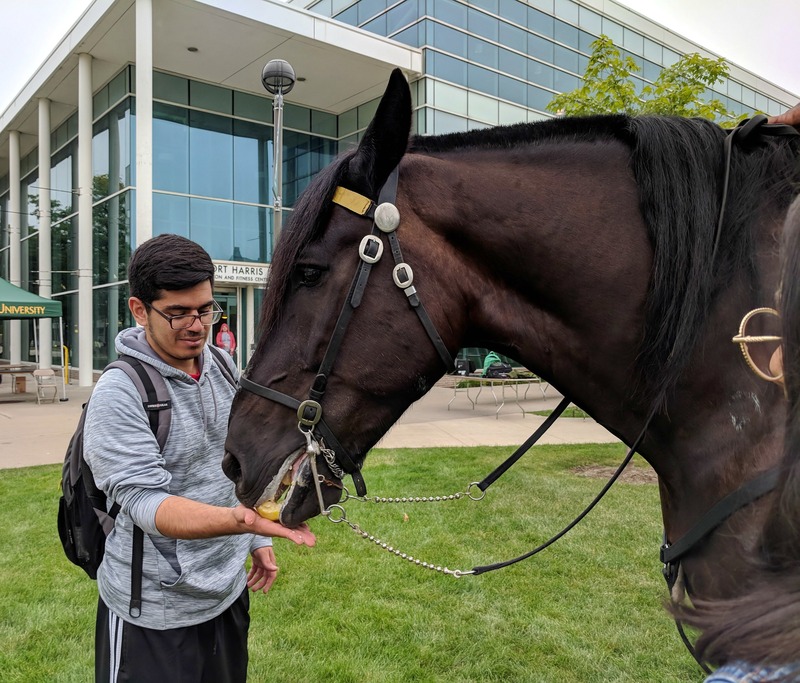 Murphy, 30, says he has the best view of campus during street patrols as he sits high atop his 15-year-old, 1,900-pound “ride.” But Andre is much more than just transportation – the highly trained Percheron draft horse is a trusted partner in community policing. A WSU student shares an apple from the Towers Cafe with Andre. 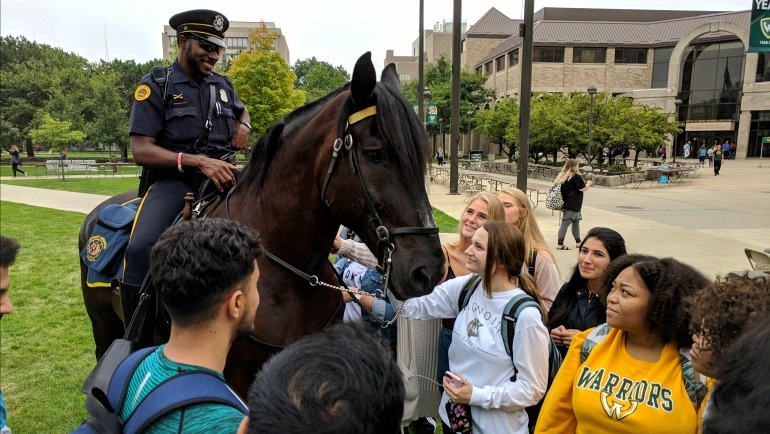 Murphy, the sole officer in Wayne State’s Mounted Patrol Unit, patrols the main campus area year-round, including the outlying areas of the School of Medicine, the Matthaei Physical Education Center and the Woodbridge area. 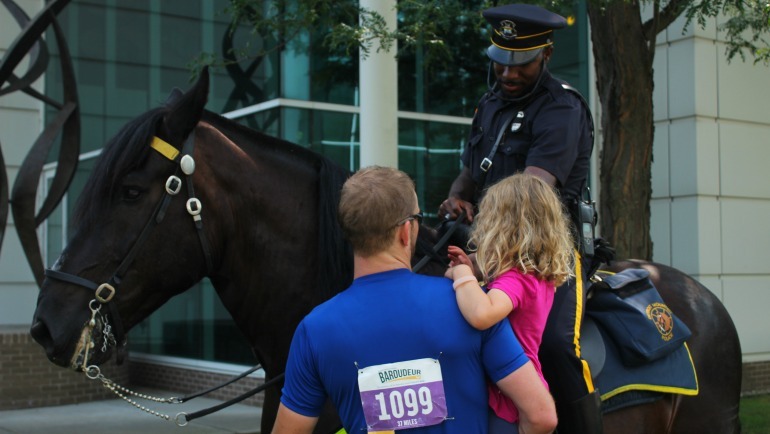 According to Holt, the role and relationship of mounted police officers to their horses can be likened to canine officers. “Officer Murphy and Andre provide critical policing as well as community engagement. They are a team and both perform important duties as partners, similar to canine officers,” said Holt. Murphy recalls two instances of teamwork that paid off for the duo. He pulled over a distracted driver and issued a ticket without leaving the saddle, which was captured on video and became an overnight social media sensation. They also broke up a fight involving several people and contained them until backup arrived. ​Though a typical day may include photo requests for selfies, petting Andre or offering him a treat, Murphy performs a regimen of tasks at the beginning and end of each shift that are necessary to ensure their safety and optimal job performance. Murphy starts his daily eight-hour shift at 6:45 a.m. arriving at the stables, located in the Palmer Park area, for roll call. At 7 a.m., all attention is focused on Andre as Murphy performs several tasks including grooming, feeding, showering and a meticulous head-to-hoof inspection, looking for any potential problems and ensuring that the horse is in top condition and ready for patrol. Following the preparation regimen, Andre is loaded on a trailer and whisked to campus, arriving around 9:30 a.m. to begin four to five hours of patrolling the campus, weather permitting. At the end of the day, Andre is loaded up, returned to the stable, groomed and showered in preparation for a night’s rest. Continuing to hone his skills as a mounted patrol officer, Murphy participates in an annual mounted police colloquium in Kentucky, attended exclusively by police officers attached to mounted units throughout the U.S. and Canada, including members of the coveted Royal Canadian Mounted Police. At the colloquium, participants navigate a challenging obstacle course, which includes jumps, vehicle extraction, firearms training while on horseback and various active crime scene scenarios. “Difficult choices have to be made throughout the course that test the officer’s policing abilities and the capabilities and skill level of the horse. It definitely is demanding, but very rewarding,” said Murphy. WSUPD Mounted Ofc. Brandon Murphy and Andre joined the family fun at the 2018 Baroudeur. Equine skills did not develop early in Murphy’s life. Born in Georgia, his family moved to Detroit while he was very young and he eventually graduated from Mumford High School. “I definitely did not grow up around horses, or even see them. I’m from the west side of Detroit — there are no horses there,” quipped Murphy. Shortly after earning his degree in criminal justice, Spanish, Latin American and Caribbean studies from Michigan State University, Murphy joined the Wayne County Sheriff’s Department in 2011 and became a member of its mounted patrol unit. Along the way, he embarked on another career journey, earning a master’s in secondary education at Wayne State and a K-12 teaching certificate. At one point, he taught full time in addition to his law enforcement career. When Murphy is not in the saddle, he may be in the classroom as a mathematics teacher for middle school kids or coaching volleyball. This semester he’s not teaching due to scheduling constraints, but still teaches in evening programs from time to time.